This Sirin Horwang movie page contains 4 records. Tee Rifle is a hitman. He is shy with ladies. He likes to walk or run around Bangkok even passing by the Red Shirts barricades! As he is a hitman, he likes to wear wick to change his appearance. He has some sexual control issues with his little bird (ลูกพ่อ) when a beautiful woman touches him such as the gym dance teacher, Chris, whom he loves her secretly. He visits a doctor to get medicine but as the medicine fails and the doctor refuses to give back the money, he takes revenge over the doctor. The gym dance teacher has arguments with her father regarding green and purple clothes colors. Her father is the political leader of the Green Shirts. There is sarcastic irony and allusion from director Yuthlert Sippapak regarding the Yellow and Red Shirts fights in Thai modern politics. With Tee Rifle, the hitman symbol is demystified as he feels guilty each time (รู้สึกผิดทุกที่). Tee Rifle meets Chris in a bar and presents himself as Mark. Tee Rifle is hired for a new job. He shall shoot all the green leaders including Chris’ father. A second medicine fails to recover his little bird (ฉันไม่ใช่กะเทยแต่ผู้ชายโชคร้าย). Political leaders use violence. Win hatred with hatred. Is it the solution to political problems? Brown, purple, green political parties. All leaders are shot by Tee Rifle. The next job is to shoot Chris! The hirer is the wife of Chris' boyfriend. Chris was not aware that her boyfriend was married already! She still meets Mark at the same usual bar and a friendship starts. Tee Rifle shots Chris’ boyfriend to close the dispute! Thanks to a good friend, Chris is aware that Tee Rifle shot her father so she wishes to take revenge. Tee Rifle is recruited for a new contract. The target has rent a hotel for his birthday. Chris knowing that the hitman will act and so she enrolls herself as a coyote dancer to be able to catch him. Seeing Chris dancing lively, Tee Rifle has a control crisis and cannot execute his job. Chris now knows that Tee rifle and Mark are the same man. Following some shooting into impressive unfinished 1997 villas, Mark succeed to escape from Chris. Chris finally catches him in a Christian church. She spares his life not because of love but because Thai politicians are the real responsible. Thailand would be a better place without politicians so as a hitman, she shoots all Thai politicians leaders! This movie mixes comedy and action. It also gives a strong social message regarding politicians that are judged responsible of the current mess in Thailand (Yellow Shirts versus Red Shirts). It features a funky soundtrack. “Saturday killer” is part of a trilogy including “Sunday Killer” and “Friday Killer”. Young Bangkokian woman Li is almost thirty years old and still single. She is coming from a local Thai Chinese family. They are involved in the trading. Her father is ultra protective. Her grant-mother only speaks Chinese. All her friends are now married. She often indulges in alcohols to forget her loneliness. Ped, her best friend, just gets married. That night she drinks too much again and has a slight car accident. She meets a young man called Lung for the first time. He helps her to start again her damaged car. Her father confiscated her car because it is severely damaged as she was drunk. She has to take Bangkok public transport (boat, motorbike taxi...) to reach office as taxicab is too expensive. She meets Lung again when she takes the Bangkok Skytrain. He works in Bangkok Mass Transit System (BTS) company at night time. She sells solar cells at daytime and has a crazy Japanese boss. Her parents still try to do the matchmakers and present her a young immature guy called Chai. During Songkran holidays her parents are going to China as usual but she is not willing to go. She tries anything to be in touch with Lung and to raise his interest. She is a a blundering lady and breaks his glasses, laptop and then his digital camera. She tries to find ways to get his mobile number. He finally invites her for Songkran festival to play water games. When a love story could really start, Li discovers that Lung is granted to study two years in Germany so he has to leave after Songkran festival. They separate as good friends. The movie ends up happily as they meet again two years later in the skytrain. Li is now working at night time as stock trader with US market. Lung invites her for the coming Songkran festival. This movie celebrates the ten years anniversary of Bangkok Mass Transit System (BTS) company. The Bangkok Skytrain was opened on December 1999. This movie highlights modern ways for ladies to seduce men, i.e. give her phone number, invite to go out, be a gik (กิ๊ก)... It is in opposition between traditional way and modern way to meet a husband. Nevertheless Li's mother forgets all her principles as her daughter couldn't find a mate. The romantic comedy "Bangkok Traffic Love Story" was the biggest success at 2009 Thai box office with 150 million baht. Cris Horwang was named 2009 best actress by the Bangkok Critics Assembly Awards. 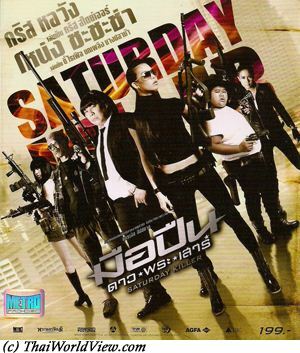 The movie also criticizes Thai popular Mass media.